Every physical attack includes an entry, a follow up, and an exit. 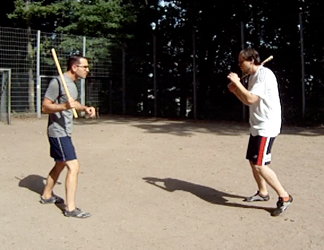 The entry consists of the motion of convergence toward your opponent if required, and the initial technique used to attack. It can be the first offensive movement, or if your opponent has attacked first, an interception into your opponent's attack. 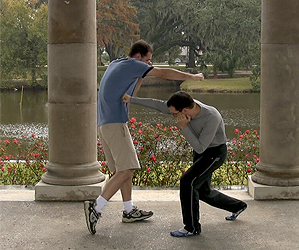 The follow up consists of any additional techniques required to disable your attacker or stop his attack. And the exit consists of your exit from the attack. The Covered Blast is a singular strategy that brings the above three components together as a covered entry, covered follow up, and covered exit. One of the above goals is far more important than the others, and that is to escape without being injured. Imagine a situation where a 'good guy' carrying a gun for self defense is approached by a 'bad guy', pulling a gun out of his pants and bringing it up to point at the good guy. Most people who practice shooting stand in front of a paper target...ready, aim, fire...and envision using their gun in such a way if they're attacked. But what really happens if the good guy is pulling his gun as the bad guy is pulling his? It's equally likely that either or both of them end up shot. The good guy's goal shouldn't be to shoot the bad guy. At least, that shouldn't be his primary goal. His primary goal should be not getting shot. Shooting the bad guy might be a good secondary goal, although escaping would be a better one. This really matters. Strategy and goals determine tactics and techniques. If you're more focused on shooting your opponent than not getting shot, the odds are far higher that you will get shot. 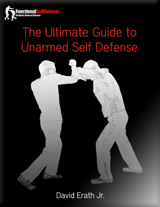 The same goes for knife vs. knife, unarmed fighting, unarmed vs. armed, etc.. Assuming you'd like to survive an attack, the primary component of any offensive or defense movement you make should be cover. Cover = safety. At least, momentary safety. It can be attained by distance, position, a physical cover/barrier, physical control via grabbing, trapping, and/or striking, blocks and deflections, and to some degree even the skill to defend against attacks to a minimal number of openings or vulnerabilities. The Covered Blast is a strategy that focuses on a covered entry, covered follow up, and covered exit. Your initial technique or interception is done in such a way that you're maximally covered. Whatever you need to do after your initial technique is done from a position of cover. And your escape from the attack is done from a position of cover. All three components can be one movement. It's possible that your covered entry completely takes out your opponent, such that it also accomplishes the follow up and exit. It's also possible that you simply make a covered exit, an escape that requires no entry or follow up. Distance dictates which techniques can and can't be used. If your opponent is unarmed and too far away to touch you, you're temporarily covered via distance. Position also dictates technique. 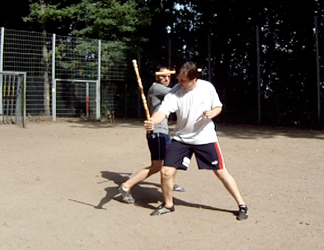 If you're behind your opponent and he cannot see you, you can strike him easily but he cannot strike you (at least not accurately or easily). Distance and position can be used to limit your opponent's options while maximizing your's. For example, positioning yourself to the outside of your opponent's center, at a greater distance from his far hand than he is from your's, provides him with less options than you. 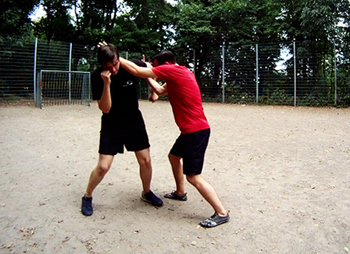 Physical control, especially in the case of a dominant position, can allow you to attack with one movement whereas your opponent must first escape from the position in order to attack you. You can attack now, but your opponent cannot. In gun fighting, distance, position, and taking advantage of physical cover (a car, building, etc.) can either make it impossible for your opponent to shoot you, or give you the ability to shoot your opponent while seriously decreasing his ability to shoot you. Using the Covered Blast involves making use of a combination of distance, position, cover, and control to maximize your options while minimizing your opponent's, along with the skills necessary to defend any limited openings that might remain. Can You Always Use It? "To secure ourselves against defeat lies in our own hands, but the opportunity to defeat the enemy is provided by the enemy himself. Hence the saying: One may know how to conquer without being able to do it." Keeping covered is up to you, but your opponent's cover is up to him. While it's possible to avoid getting taken out, you can only take out your opponent if he provides you with the opportunity. You can always use the Covered Blast, and it will keep you safe. But if your opponent remains covered, it will end with a covered exit that allows you to escape without taking out your opponent. The best defense is 'not to be there', and a covered exit accomplishes that goal. The aim in FSD is for every defense to be a Covered Blast. Every technique we use is part of it, and every training method is used to support it. 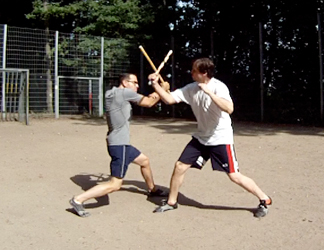 The theory of the Covered Blast can be used with any type of technique or martial art. The caveat is, it must provide cover via the technique itself or a combination of the technique with optimal distance, position, cover, and control. In FSD we have what we call the Fundamental Five, five covered entries used to begin the Covered Blast in a variety of situations. The smack and hack is a great example of a covered entry against an imminent threat. The crash is a good example of using a covered entry as an interception. 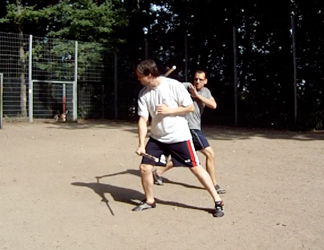 And the eye strike in this hit and run demonstrates using position to limit the opponent's options. White shirt steps in to hit gray shirt in the head. Gray shirt steps in with an 'attacking blocks' covered entry, getting to a superior position. Gray shirt uses a covered follow up with a strike to white shirt's head and/or weapon bearing limb, preventing a second strike and potentially injurying white shirt. Gray shirt also jams and controls white shirt's arm after the hit. Gray shirt hits white shirt in the head while moving even further away from the weapon, and then steps behind and away from white shirt, hitting him in the back of the head with a covered exit. 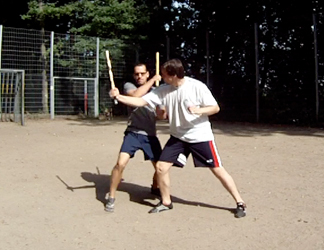 The Covered Blast works particularly well with all weapons, and you'll find it used over and over again in our kali and eskrima techniques. Because we aim to use the Covered Blast in everything we do, you'll find examples of its use with various martial arts thoughout our site. 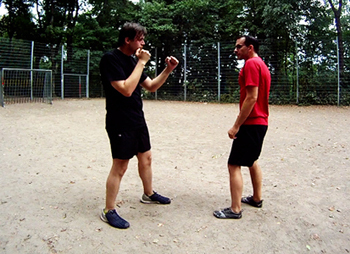 In boxing, the combination of simultaneous counter punching combined with footwork and covering makes using it ideal. 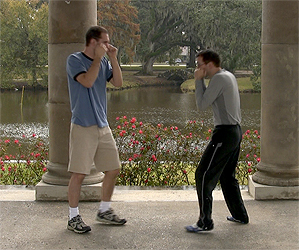 This simple duck and jab is a great example of a covered entry. Wing chun trapping provides excellent tools for the Covered Blast, and you can see it in use with the lop sao and bong sao for example. We even use it in aikido, as in this example of sankyo. 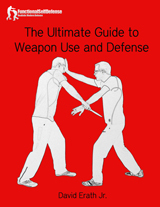 Whatever self defense or martial arts system you train, integrating the theory of the Covered Blast will make your applications more efficient, effective, and functional.